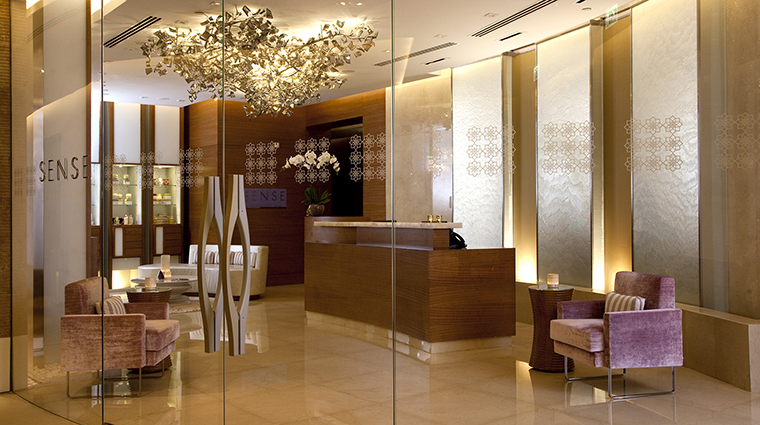 While primarily a business hotel, Rosewood Abu Dhabi doesn’t skimp on luxury, and its Sense Spa is especially decadent. There’s plenty to entice business travelers along with sybarites — a menu of harmonizing and tailor-made experiences is ready to pamper you in the nine treatment rooms (four men’s, four women’s and one couple’s suite). Decked out in marbles and rich wood tones, the spa’s overall feel is masculine yet calming and cosseting, beginning with the wood-accented relaxation lounge and its selection of Ronnefeldt teas. Dimly lit and minimal in style, the senses are put at ease upon entering without overwrought design calling for attention. Though a striking, iridescent coral-inspired piece of contemporary art at the spa’s reception is well worth pausing for examination. 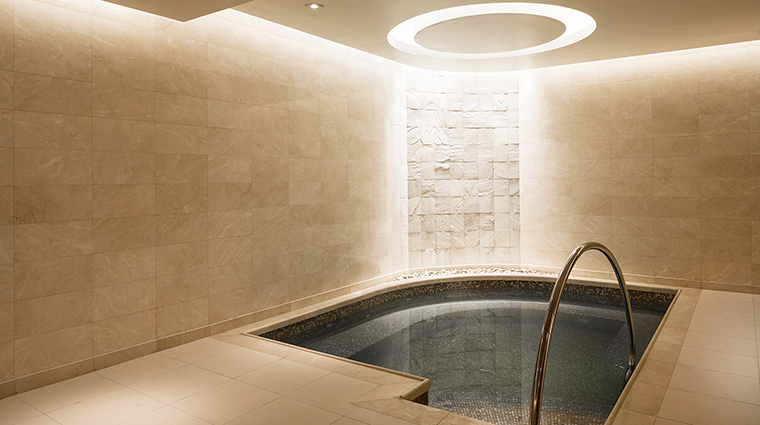 The couple’s treatment room has two Jacuzzis and a spacious steam shower with sleek marble seating and walls. A “star-lit” ceiling completes the space, making it ideal for a romantic dual-pampering day. Bathed in dark browns, the rooms have an immediately comforting and warm feel. Each features a private changing area, adding to the exclusive experience. Athletic business travelers will love the Abu Dhabi spa’s “power lunch.” Offered during weekday office hours, the deal includes a workout and a healthy takeaway meal, making good use of a lunch break. A private fitness studio is available for personal training sessions, as well as twice weekly scheduled yoga classes. 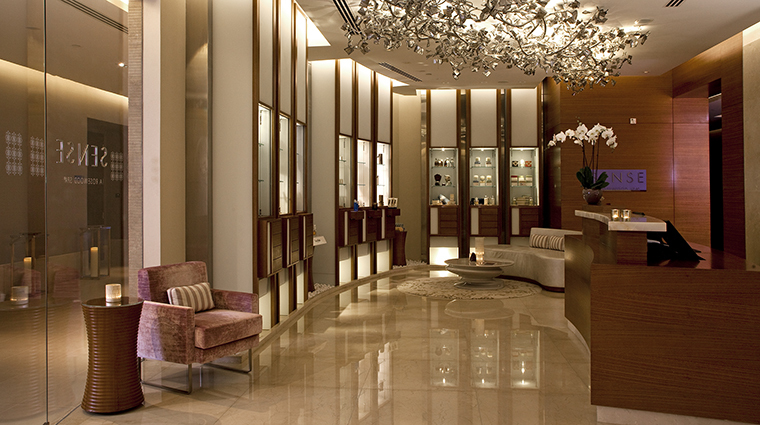 Treat yourself to a Natura Bissé facial, tailor-made to rebalance your skin. Not all treatment rooms have a private Jacuzzi and steam room. To ensure you get to enjoy this extra perk, add on a 30-minute soak (like the softening Cleopatra Milk Bath) to your session. The Abu Dhabi spa is at its busiest on Fridays and Saturdays, so be sure to book ahead if you’re planning on indulging in a treatment on those days. On the flip side, be prepared to find a full gym Sunday through Thursday, but plenty of free machines throughout the weekend. 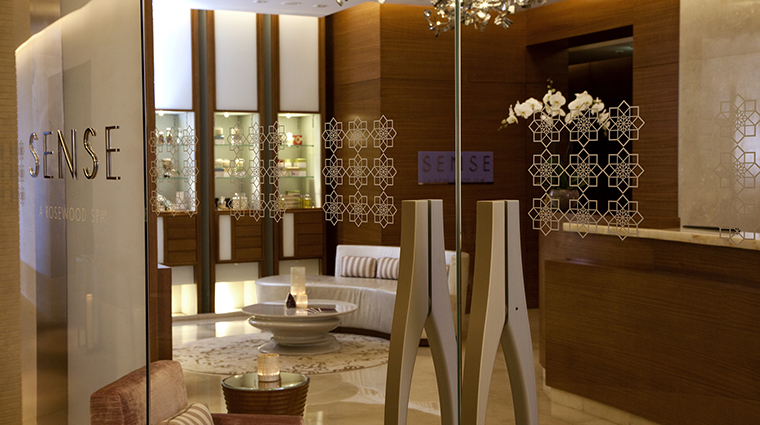 Primarily catering to the business traveler, Sense Spa features a menu of express treatments like the 30-minute Upper Body Massage, created for those with packed schedules. 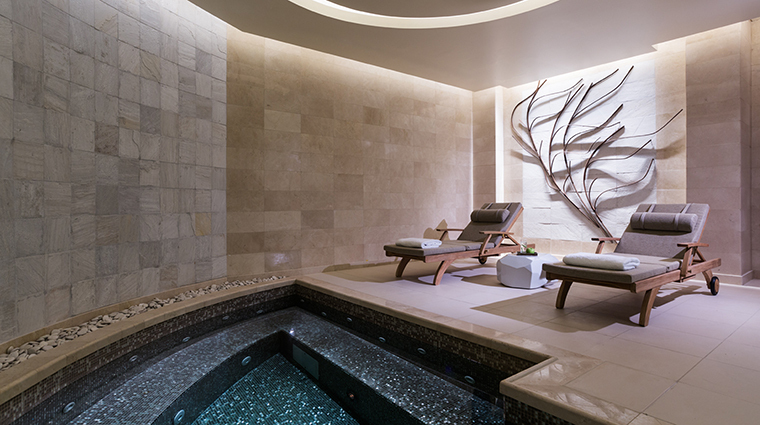 The luxury spa retains a sense of place with culturally inspired experiences, such as the Desert Rose treatment that features floral-infused argan oil and exfoliating sand from the Moroccan desert. For something a little different, opt for a hammam cleansing ritual before a more traditional therapy. You’ll get an individual suite connected to the Turkish bath for total privacy. Unfurl your knotted-up muscles with the signature massage, which employs smooth, heated rosewood sticks and an oil with Arabian botanicals. Make a day of it by adding on a pool pass or afternoon tea to your treatment. In line with the local culture, the sexes are separated, but the women’s and men’s relaxation areas are both exactly the same with a Jacuzzi, a sauna, a steam room and a cold shower to lower body temperature and blood pressure. There are two private hammams — no need to worry about public bathing here — in spaces of iridescent bronze mosaic. Each has its own private steam room. A large fitness center features state-of-the-art equipment all provided and regularly updated by Technogym.